I hope you remember the research projects I set for my group of students last year? As I said at the time, the research, supported by Charity Soul funds, takes months to work through, and we’ve not been idle over that time. I hope you’ve been taking note of the many articles in the newspapers and in the other media, describing gene editing as THE biology of the decade. 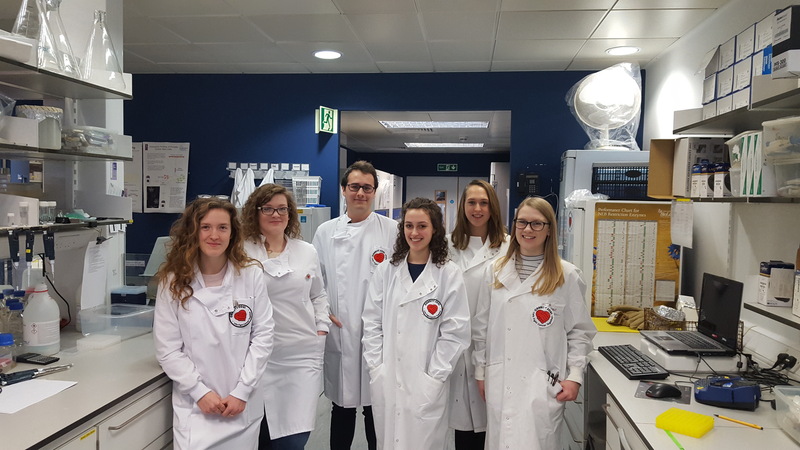 All of our 2017 students have now got their degrees (some did exceptionally well and are on their way to a career in cancer research), but the ‘gene edits’ they did are still in use in the laboratory. To make sure the edited cells are what we thought, my research technician, Hannah Walker has now determined the sequence of the DNA in all of the cells. In a normal cell there are 2 copies of every gene, which is made up of 4 building blocks (bases) a bit like different colours of Lego bricks. The genome sequencer we use reads along the strings of DNA and each base (brick) comes out as a peak on the printout. I have shown this for a normal unedited cell in the picture below. Sometimes there are 2 peaks superimposed on each other. This is usually a natural variation, characteristic of each person. So what happens when the gene is edited? Well, the edit ‘takes out’ a few of the bricks at a very specific point. The string is then stitched back together again. If you look at the trace below can you see where the edit has occurred? It’s right where the sequence readout seems to go haywire compared to the normal trace in the first picture. So it works! In fact it happened in about half of all the samples we edited, a great result, so we have plenty of cells to study. Perhaps I should remind you of what we are looking for? These are genes which we think influence the development of cancer, from stem cells. But we don’t always know how they work. So we have edited the genes out in -not cancer cells- but what we call pre-malignant cells, which are teetering on the brink of being cancer. If the edited gene is important, it should confer cancer-like properties in the pre-malignant cells. That’s where we are right now – checking out the properties of the cells. However we did have one instant success. The editing of one gene (P63), which we thought was important for the survival of the cells, has done exactly what we expected. After editing, the cells were still alive, but they were unable to grow out to make a tumour. This made the edit really difficult to study, but entirely agreed with our previous research. So there’s more to come still……. Every year brings a new set of young and enthusiastic students to learn in my research lab. This year, another 5 students are each editing genes from my target list. I finally managed to capture them all in one place for the photograph you see below. Just like last year the edits have been carried out, and we are starting to see some exciting changes to the cells. Still early days, but the story is beginning to emerge. Lastly, you may remember a news item in my last message. This involved the work of a young Italian Scientist Giovanna, who was training with me in York doing research supported by Charity Soul funding. The story of her discovery got picked up by the radio and the Sunday Mail, with some very significant interest around the world (from Australia and the USA). Best of all Giovanna was very keen to further her career in the USA, and I am pleased to tell you that she is now in San Francisco, hopefully spreading the good news about York University and (of course) Charity Soul in her new job at the University of California.